There's a ton of new features in iMessage for iOS. A ton, we tell ya. There's so much new stuff, in fact, that you will most likely miss some of it if you don't intentionally check every nook and cranny of the app. Fear not, iOS 10 user, for we have you covered on this one! Here's our complete guide of all the new and updated things in iMessage for iOS 10. Enjoy! Invisible ink: Obfuscates your message in mist. The recipient has to tap on the bubble to reveal the message's content. Gentle: Message bubble is sent small but grows to normal size... gently. Loud: Simulates yelling with a big message that trembles and then shrinks. Slam: Message is slammed into the chat with a satisfying puff of dust, sending a shock wave through all visible bubbles above. Has to be our favorite. Note: If you are using “Reduced Motion” on your device, the “Effects” sub-menu becomes completely inaccessible, and you won't be receiving any animated messages either. iMessage for iOS 10 adds ephemeral content to the mix, in the form of Digital Touch scribbles making the jump from the Apple Watch to the iPhone. To send one, tap the arrow to the left of the message box and select the Digital Touch icon (looks like a heart with two fingers on it). 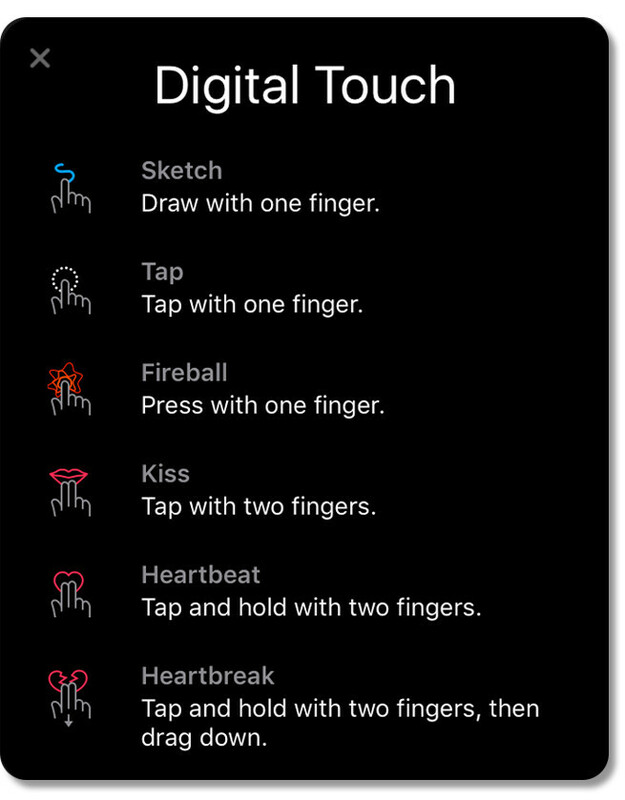 You can then perform six different actions on the black canvas that will yield you different results – you can simply sketch with one finger, tap with one finger to send “taps” that look like drops of water, long-press with one finger for a “Fireball”, tap with two fingers for a “Kiss”, tap and hold with two fingers for a “Heartbeat”, and long-press and slide down with two fingers for a “Heartbreak”. You can also perform the aforementioned actions on photos and even over 10-second video clips. To do this, tap the “Camera” icon on the left to open the Digital Touch canvas in full screen, and then either tap on the red “Record” button in the bottom middle of the screen to begin recording, or the white “Shutter” button next to it to take a still shot. You can draw on the canvas before, during, or after you've recorded a video or taken a picture. All Digital Touch scribbles disappear within 2 minutes from sending them, but can be kept by the recipient. The sender is notified of when a temporary message is kept. You can send cool handwritten notes by tilting your iPhone in landscape mode. If you still see the on-screen virtual keyboard, tap the new “scribble” button, next to “return”, and this will open a blank “canvas” to doodle and write on. Anything you draw on the virtual paper settles with a subtle, but nonetheless cool, ink bleed effect, while the recipient will have the dubious pleasure of seeing a playback of your calligraphic efforts. If you should find that the fine art of hand lettering is not for you, you can choose from a number of pre-made handwritten phrases, but where's the fun in that? Your handwritten messages are kept in the quick access tab at the bottom of the screen, but can be deleted by long-pressing them and tapping the “x” button. Emoji play a bigger role in iMessage for iOS 10. No, literally, emoji are bigger than ever before. Three times bigger, to be exact. Not only do they take up more real estate on the screen, but now there's a feature to “translate” your messages — or at least parts of them — into emoji. After you compose your message, you can then switch to the emoji keyboard and see which words in your message are eligible for “emojification”. They will be highlighted in orange and tapping on them will reveal a pop-up with relevant emoji. Tap on one to replace the word with it, tap again to switch back to the word. Speaking emoji has never been easier... which can either be a good or a bad thing, depending on your point of view. Sticker and emoji packs can be downloaded from the new iMessage App Store. Tap the “>” button next to the message box, and then tap the “App Store” icon. Recently downloaded sticker packs and apps will be displayed on the first page. Swipe left to scroll between packs and apps. Sending stickers is easy – tap and press “Send”. More fun, however, is the ability to stick them to already sent messages. 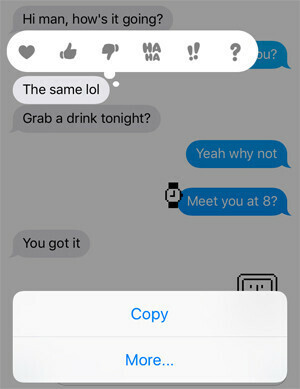 To do so, tap and hold on a sticker to “unstick” it, then move and drop it onto whichever message you like, including photos and other images. While holding the sticker, you can use a second finger to scale and rotate it before it's placed. Tip: If you receive a really cool sticker and want to know where it came from and how to get it, you can simply long-press on it to get more info and even open its respective pack in the iMessage App Store. You can now run apps within iMessage, in place of the virtual keyboard. Currently, there is a limited handful of them available on the App Store, but this will change in the coming months, as more and more people adopt iOS 10. There are also multiplayer games to play while chatting, so that's a thing. We tried WordsWithFriends, which is essentially scrabble. Both participants need to have the game downloaded and installed on their devices. Moves are sent between the players, much like regular messages. It's a simple and fun distraction. You can now copy, delete, and “react” to sent messages by long-pressing them and selecting one of the available actions. Your reaction will appear next to the message in a separate bubble. This can be done to both sent and received messages. Messages can be deleted in bulk by long-pressing, selecting "More", and marking multiple entries. Of course, this will make them disappear only on your side, without affecting the other participant's chat history. Read receipts can now be turned off for individual contacts. This can be done by going to Settings>Messages>Send Read Receipts and switching off the toggle. You can also do this for separate conversations by tapping the “information” icon in the top left corner of the screen and toggling “Send Read Receipts” off. Every image you send in iMessage, be it a photo or a screenshot, can be doodled on. Select the “Camera” icon to the left of the message box and choose an image to send. Then, once it appears in the box above, tap on it to open it in full screen mode, and select “Markup” in the bottom left corner of the screen. You can then draw or annotate the image in a number of different ways. When the message box empty, the “Send” button is replaced by a “Microphone” icon. Long-press on it to begin recording, slide up to send. Voice messages also expire after 2 minutes, unless the recipient chooses to keep them. Whew, that's it! These are all the new things that we managed to find in iMessage for iOS 10. However, since there is just so much new stuff in this update, we might have missed something along the way. If we manage to find a cool feature that's not feature here, we will make sure to update the article. Until then, have fun with the new iMessage! Google, Samsung and the others: time for imitating Apple. Everyone is copying everyone nowadays. Apple copies Android, Android copies Apple. Welcome to reality. It's all good if you love tech. They should copy it because this is a great messaging app.